Every once in a while, something revolutionary hits an industry – hopefully for the better. Such is the impact of the Eye-Fi memory cards for digital cameras. The newest in their line, the Pro X2 is an absolutely astounding combination of 8 GB of memory, WiFi support, geotagging, RAW support and ad hoc network capabilities. If there is a photographer on this year’s gift list, you couldn’t find a thing he’d like better. 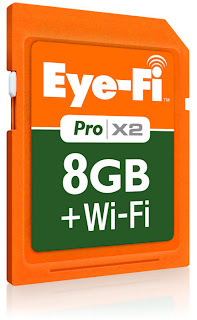 Assuming your camera uses SD cards, Eye-Fi has a card for your situation. If you use SD, and especially if you shoot RAW photos, you need to load up on the Pro X2. Where to start? There is so much to like about the card. SPEED Writing photos to your card is done at impressive Class 6 speeds. A card is only good for pros if the data can be written as quickly as the photographer is shooting. I recently shot snow-tubing races and this card had no trouble keeping up with me. 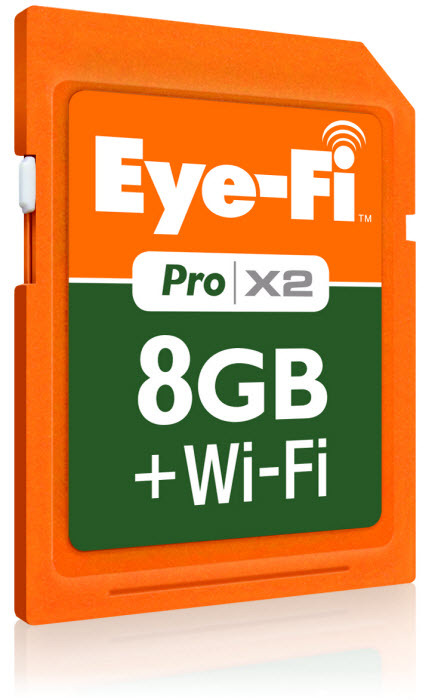 SIZE While all the current Eye-Fi cards offer at least 4 GB, the Pro X2 offers a generous 8 GB of storage. For a professional Nikon shooter, shooting RAW images, that equates to almost 400 images per card. For an amateur shooting JPEG images, expect well over 1,000(up to 4,000) images depending on the quality setting in your camera. UPLOADING For my entire previous shooting career, uploading my images was a case of finding my card reader, plugging it into the appropriate computer and then waiting while it transferred my images. With the Eye-Fi line of cards, assuming you have WiFi, when you turn on your camera within 45’ of your computer (90’ outdoors), the transfer starts automatically. Photos are delivered wirelessly to the folder you designated during setup. No more removing the card. Just turn on your camera and watch the photos fly onto your hard drive as each photo shows in a small thumbnail on the lower right corner of your screen. AUTO SHUTOFF Watch for auto shutoff on your camera – if it shuts down before all the images are transferred, you’ll need to restart it or transfer the old fashioned way. Many cameras now have support built right in for Eye-Fi cards and they will not only stay on during the entire transfer, they are smart enough to turn your camera off when completed. Over 10 million cameras now have this support built-in. ENDLESS MEMORY What’s that – endless memory? With a configuration you set, the card is actually smart enough to know what files have already been uploaded, and if you start to fill your card, it can erase those photos you’ve already uploaded to make more room for continued shooting. The percentages when this kicks in and the whole process is determined by you during setup. NETWORK COMPATABILITY Eye-Fi works on all 802.11 b/g/n networks. Depending on the traffic on your network, it’s capable of transferring data at 10-15 megabits/second. HOTSPOTS As you travel, you probably don’t carry your router, so photos can be uploaded and saved at thousands of AT&T hotspot locations including Starbucks, McDonalds, hotels and airports. One year of hotspot access is included with your purchase. AD HOC NETWORKS Out on a beach, up in the mountains, no router and no networks = no trouble. You can set up your laptop to create an ad-hoc network and wirelessly transfer photos anywhere. ONLINE UPLOAD As your photos are being uploaded, they can also be stored in the cloud on a special Eye-Fi server. Your photos go here for a rolling 7 days, just in case your camera should get lost or stolen. After seven days, Eye-Fi assumes they are safely stored somewhere else and then removes them. If you want permanent storage, that’s an extra cost option. If you are using a metered data plan, this feature can be turned off to avoid excessive charges. Once online, you can share the photos with any smartphone. VIDEO The Eye-Fi cards can handle a variety of video formats including: mpg, mov, flv, wmv, avi, mp4 and mts. Files are limited to 2 GB in size. Videos can be uploaded wirelessly to YouTube, flickr, SmugMug, Picasa Web, Phanfare and Photobucket. GEOTAGGING There is no GPS actually onboard the card, but with an amazing use of Wi-Fi positioning technology, if you are near any Wi-Fi signal, it will register it and use it to geotag your photos. Even if it’s a secured Wi-Fi signal you don’t have permission to use, it will locate the signal’s source in a database and use its location to tag your photos. Truly amazing. Since it’s using WI-Fi instead of GPS, that means it will actually work inside a building where standard GPS would not. RAW FORMAT Pros generally shoot RAW images, and that’s an area where the photo industry could have been nicer to Eye-Fi. Every camera manufacturer seems to have their own proprietary RAW format and metadata is kept in different places on different brand cameras. So, even though the Eye-Fi Pro 2X will shoot, store and transfer RAW files just fine, don’t be surprised by mixed results when it comes to some of the other features. I experimented with Canon and Nikon RAW formats. In all cases, the files transferred to my computer with no problem. Sometimes, the thumbnails would show up, sometimes not. Sometimes the geotagging would attach itself to a RAW file and sometimes not. As more and more cameras begin to incorporate Eye-Fi technology right into their operating systems, expect this to get better in the foreseeable future. This tiny card has already revolutionized how I shoot and how I think about shooting. I doubt I’ll ever buy another standard media card for my SD equipped cameras. Eye-Fi just has too much to like.